Recap: in June Donald Trump and North Korea leader Kim Jong Un held a Summit in Singapore to attempt having North Korea denuclearizing. Through the handshakes and smiles, no agreement was made, specifically on North Korea behalf. Therefore, the recent admission from National Security Advisor John Bolton that Kim Jong Un is not denuclearizing and continues to test nukes is no surprise. Sidebar: during the 2014 and 2016 elections Donald Trump and many other GOPPERS stated they would make better deals on the Iran Nuclear Agreement, however the Summit illustrates something different. Since Trump has been in the Oval Office, he has tarnished America’s reputation around the world and ruined relationships with our allies. The disaster of not accomplishing a real agreement adds to the failures of Donald Trump not knowing what he is doing. “There’s definitely a pattern where North Korea agrees to denuclearizing in theory, but then there’s not really a substantive process they agree to actually hammer it out, says James McKeon.”The Wired. Sidebar: early in June Donald Trump stated, “he does not have to be ready for the summit.” When it comes to making agreements with other countries on any issue, it’s important to know and understand how the leader of the nation operates. 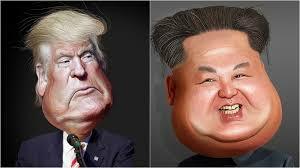 Donald Trump unpreparedness illustrates to America and the world he was not serious about the Summit or any agreement with North Korea. Furthermore, prematurely tweeting, “the world can feel safer now” when no real agreement was made illustrates the lack of knowledge Trump has when it comes to international relations. Many experts cautioned that the situation was still extremely dangerous, as Kim only signed a vague mutual commitment to denuclearizing the Korean peninsula — a promise North Korean leaders have made and broken multiple times. Also, from Newsweek, “Regardless of the smiles in the summit many in Japan, South Korea, and the U.S. Congress doubt that North Korea is sincere in its intentions.” Sidebar: listening to experts is how the Iran Nuclear Agreement was successful. To begin, both Donald Trump and Kim Jong Un were calling shots at each other causing the Summit to be on and off. Also, world leaders knew nothing would get accomplished in this Summit when both men are irrational. The Summit was nothing more than a stunt on Donald Trump behalf to “show” he did something. Since the news came out North Korea is continuing with their testing and creating nuclear war heads, Trump has been silent. Sidebar: no negotiations were ever going to be made to halt North Korea from developing nuclear weapons. Sidebar: no negotiations were ever going to be made to halt North Korea from developing nuclear weapons. Furthermore, after the disaster of the G-7 Summit with Trump alienating and ruining our relationships, his attempt to have North Korea “agree” to denuclearizing was a joke. Kim Jong Un vague “agreement” was a clear sign North Korea was never going to stop with their nukes. Understanding international affairs, specifically dealing with nuclear weapons, Donald Trump fails. Overall, the mission was not accomplished, there was no real agreement between Trump and Kim Jong Un to denuclearizing, and the world continues to have two irrational men with access to nuclear weapons.